I use FL Studio... I cannot seem to find a way to automate the whammy bar bend. What am I missing here? Hi! It's all good. Thanks for purchasing! Whammy bar is controlled by pitch bend and cannot be automated. Hope it helps. Let us know if you have further questions. Okay, thanks for the info. So I understand that it is controlled by the pitch bend, but are you saying there is no way to automate the pitch-bend with a generator knob? For example: I see tons of other pre-loaded generators in FLStudio for Heavier7. I just can't seem to find anything for the pitch-bend. Actually... it's just the channel pitch you'd need to automate. Right click it and select "Create automation clip." As the automation takes place during playback, you'll notice the whammy on the H7S UI moves accordingly. DarkFlameSquirrel wrote: Actually... it's just the channel pitch you'd need to automate. 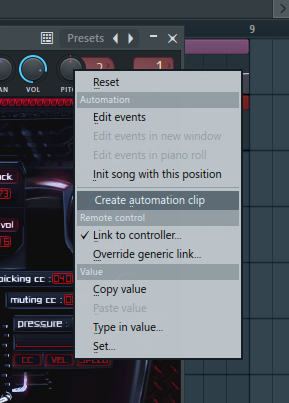 Right click it and select "Create automation clip." Okay, you rock. Thank you very much.